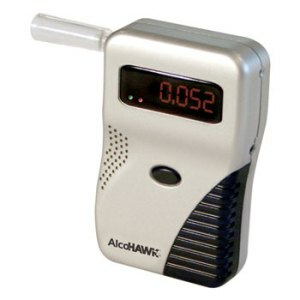 The AlcoHAWK Precision Breathalyzer is one of the most popular units in the AlcoHAWK series line. It features a robust design made of impact resistant abs material. The unit screens for the presence of alcohol quickly and is an ideal solution for portable tester with professional quality. This unit is equipped with a clear Ruby Red L.E.D. display. The AlcoHAWK Precision has also been upgraded with new technologies to improve it's breath capture accuracy making this model ideal for zero tolerance screening. This unit meets DOT/NHTSA Model Specifications for Breath Alcohol Screeners and has FDA 510k Pre-marketing clearance. Comes pre-calibrated ready for use. Package includes gift box, tester, 5 mouthpieces, soft pouch, owner's manual, quick start guide and 1 year warranty.